View topic - Where to paddle in the USA in Nov/Dec? Where to paddle in the USA in Nov/Dec? Post subject: Where to paddle in the USA in Nov/Dec? I've never paddled south of the border. I'm in my first months of retirement and have been paddling a lot in Ontario, solo and with my family. The cold nights combined with rain are making near north multi-day trips less viable as October progresses. I'd love to explore some American paddling destinations, places for some good paddling in November and even December, if possible. Places I could drive to from southwestern Ontario in a day or two would be good. I really don't know where to start looking. I searched online a little on North Carolina. I remember coming across some good info on the Solo Tripping site , but the site seems to have been discontinued, unfortunately. Does anyone have any recommendations re: paddling info sites or better yet, some trip recommendations? Flatwater trip logistics are easiest, but river trips are good, too, especially if shuttle services are readily accessible. If you had the time and could get away, where would you go? Thanks in advance for any of your ideas. Post subject: Re: Where to paddle in the USA in Nov/Dec? It takes us 1.5 driving days to get to western Ontario from Atlanta, so figure 2 days on I-75 to get down to northern Florida. The Florida panhandle has a lot of great winter canoeing, if you have just a little bit of luck with the weather. We just paddled Coldwater Creek near Milton, and stayed at a cabin of the one outfitter, Outdoor Adventures. Blackwater State Park might have cabins open in the winter, I don't know. Blackwater is even more beautiful than Coldwater. I'm including a link for Florida paddling trails. Farther south in Florida, we have paddled Juniper Creek, Ichetucknee Creek, and the Loxahatchee "River." There are a number of nice paddling runs with outfitter support in central Florida, and there's also Sea World, Disney World, Cape Canaveral, etc. The Loxahatchee is way down by Jupiter and West Palm Beach, but there are rentable cabins in Jonathan Dickinson State Park. Here are the links. I'm including some trip accounts I've done for the New Orleans area because you could have a good time there if you locate a place to stay. Paddle in good weather, see the French Quarter, etc., in so-so weather. I have been on the San Juan in Utah in April. It's spectacular, but I don't know what it's like mid-winter. The Rio Grande has some nice sections too. The Buffalo National River in NW Arkansas attracts a lot of Ontarians as its an easy two days from SW Ontario. But it can get a tad cold in November. Not sure if I would do it in December. Edisto River in South Carolina has attractive campsites and great canoeing. on the menu bar across the top, look for "go paddling"
in that drop down menu, look for "water trails", and "places to paddle"
Martin, the loss of some of the information on the SoloTripping site is a damn shame. Assateague Island National Seashore, MD. A long ways off the I-95 ccorridor (but not far from Rte 13). 5 paddle-in sites spaced along the Maryland length Chincoteague Bay. No site reservations available (and usually not needed in Nov/Dec). Permits required (pick up at the ranger station before launch). Nov 4 – 14, Nov 18 – 22, Dec 9 – 17. January 22nd 2013 onwards. I’ll be there a time or three this winter. 60 miles east of I-95, just south of the VA/GA line. We’ve never investigated the car camping sites, but the paddle-in sites are a short buoy-marked trail across the swamp, as are 3 large group sites reservable by paddling groups of 8 or larger. The adjoining Lassiter Swamp and Bennetts Creek are true gems for day paddling exploration. 100 miles east of I-95 and worth the drive. Fantastic beach front sites just a short paddle away and day paddling opportunities in a maritime swamp forest. Best visited in the off season when the ferry service is not operating. The park has a wonderfully interesting history as well, which you can contemplate as you sit in camp and watch the Atlantic surf between the dunes. I’m headed that way soon to paddle there and elsewhere on the NC coastal plain. 20 miles east of I-95. A long, linear paddler’s park along the Lumber River with two car camping areas and several up-scale paddle-in sites along the river. There are a couple of local outfitter/shuttle services available and the park staff is impressively friendly, forthright and knowledgably in sharing information and suggestions. Cumberland Island National Seashore or Crooked River SP, both about 10 miles east of I-95 in Georgia just above the Florida line. Cumberland Island is an amazing place, but the Nat’l seashore there doesn’t seem amenable to paddle-in campers on the Cumberland Sound side. There are hike-in backcountry camps inland north of the ferry landings, and walk in sites at Sea Camp Beach on the Atlantic side (take the ferry over and wheel gear across the island in sand carts), but nothing specified as paddle or boat in-able. Maybe the primitive backcountry campsite at Brickhill Bluff. Or, perhaps alternatively, camp and launch from the nearby Crooked River State Park just north of St. Marys and paddle over to Cumberland for daytrips if the wind and weather permit. If you make it as far as the Florida border you should keep driving south for a few hours. There is a huge amount of excellent paddling in north Florida – Suwannee, Santa Fe, Withlacoochee, tidal stuff on both Atlantic and Gulf Coasts and of course lots of spring runs like the Ichetucknee, Juniper and etc. And if you make it into north Florida, well, how much further is it to the Everglades? One caveat on the Maryland and even North Carolina suggestions – I don’t mind cold weather as long as the water doesn’t freeze. Assateague and Hammocks Beach are often very windy, and depending on the recent weather things can be icy even into the Carolinas. November and December are safer bets than January and February in the mid-Atlantic States. One nice thing about State Park or Nat’l Seashore venues is that if you get there and the weather is unsatisfactory you can car camp/day paddle for a day or two and wait for better weather, or camp and continue south ISO sunshine. A day... a full day! The FL-GA line is 19 hours from Toronto. You are only 2/3 of the way to the Glades. For multi day trips I am partial to the Suwanee with its magnificent sand bar camping. I have only done three day trips.. Certainly much longer trips are possible camping out. Florida paddling anyone.. where to start. Florida probably has the most paddling trails of any State in the US. I forgot to add the Current River in Missouri.. you can do a neat 100 mile trip that will take several days. Local paddlers there go out year round. The Current River water level is more reliable than the Buffalo as the former is spring fed. I miss that thread that Mike and I and some others contributed info on winter paddling for southbound paddlers. Thanks for contributing here Mike. A big thank you to those of you who replied. You've given me some great starting points. So far each destination and link that you've listed that I've pursued opens new doors and has really fueled my interest in heading south...and soon! Sincere thanks to all of you for taking the time to reflect and respond. I'll post again before I head south for the first leg. I'm thinking of keeping Georgia and Florida for December when I may be able to rendezvous with family members during their vacation time. Swamps, alligators, and the Suwanee River look really interesting. Our cousins to the south do this kind of thing much better. Of course you will find meetup groups in other states too. I expect that you need your own boat though. Two years ago I did a day paddle with a Meetup paddling group in FL. Its a great way to do shuttles. Even though I did not know anyone at the start we soon got acquainted and I had a marvelous time. So far each destination and link that you've listed that I've pursued opens new doors and has really fueled my interest in heading south...and soon! I just returned from a 9 day NC paddling trip, including 4 days at Hammocks Beach. While some of the details are still fresh in mind I’ll fill in some detail on that destination. We planned our visit to take advantage of the tidal flow at Bouge Inlet, looking to catch a high and falling tide for a ride out and a rising tide for the ride back. For coastal venues like Hammocks Beach and Assateague timing the tides is hugely advantageous, for tidal water direction and depth. Select Bouge Inlet, scroll down and pick the month, start date and number of days and hit “Get tides”. If you select a couple of 14 day periods you’ll likely find an ideal sequence of tides for paddling in and out. One caveat on selecting tides when travelling in, out or through inland marsh zones: Marshes are like giant sponges and take a long time to tidally fill and an equally long time to empty. The high tide at the Hammocks Beach launch, only a couple of miles inland from Bogue Inlet, runs at least an hour (maybe closer to two) behind Bogue Inlet. And a second caveat – an onshore breeze will delay a low tide by helping fill the marshes, and conversely an offshore breeze will help empty them. About the Hammocks Beach campsites; there are 14 sites on Hammocks Beach, as well as a couple of group sites. The easiest entrance is via the “Canoe Route” gut on the (very inaccurate) map above. The three sites along the gut on the way in, #’s 12, 13 and 14 offer the shortest carry and perhaps the best wind protection. They are also the only sites on Hammocks Beach that have trees to make them actually hammock-able. Site 14 is a large open site, decently wind protected with a good landing (but limited hammock trees). There is a low tide sandbar further up the gut towards 12 and 13 that requires an ankle deep pullover at low tide, so 14 is more easily accessible in low water. Site 13 is a small site with a nice sandy landing and offers great 360 views from the top of the towering dunes at its back. Site 12 has a sketchy landing at high tide, but has the best shelter and hammock-ability with an open space set back in a closed canopy of surrounding trees. None of those would be my choice in bug season, but in the chill winds of November or December #12 might be ideal. The ocean-front sites (1-11) are more exposed, set just back of the dunes from the Atlantic. If isn’t cold and windy some of those would be my preference. Same preference is it was close to the shoulder seasons of bugdoom. The best of those sites would be # 6 or 8. The landing at the back of the gut is a perfect shallow sand beach with firm footing. Unfortunately that firm footing lasts for only a few yards. Inland, from there to the Atlantic intertidal zone lies the loosest sand on which your will ever tread foot. Loose sand and steep dunes do not make the gear toting into camp easy. Site 6 is small and in a somewhat wind protected hollow. It is close to the landing but still secluded feeling, and views of the Atlantic are as easy as standing up and looking over the front dune. Site 8 is a large site, set deep within in a ¾ semi-circle bowl of high dunes and perhaps the best wind protected beachfront site, open only towards the entrance gut (north). Site 7 is more open to both the ocean and back bay, and would be a chilly site in off-season winds. 9 and 10 are open to the bayside but behind at least a bit of Oceanside dune, and 11 is open on both sides. Hammocks Beach sites are reservable, and we foresightedly took 7 and 8 to accommodate a potential group of 4, with three tents, a sun tarp and some form of bug shelter. We met some canoeists taking out at the launch who foretold that the noseeums were bad, and opted to bring both a 16x16 parawing for shade and a screened Mantis tarp for bug escape. Our third choice was a full screen house, which we opted to leave behind. Joel slept in the Mantis, which proved not to be an ideal shelter for sand environs. He shared his bed with an inquisitive ghost crab, and whatever blowing sand entered through the front mesh. Another beachfront Mantis discovery – setting up or taking down the floorless Mantis tarp in beach environs means that a significant dusting of sand will end up adhered to the interior underside, there to shake off onto one’s head in the night breezes. Taking it down with some morning condensation still wetting the underside means I’ll be setting it up in the yard at home and plying a whisk broom to the underside before using it again. That range of shelter still provided valuable options. Fortunately the temperature dropped a bit over the next few days, the late season noseeums were only occasional and largely tolerable, and the flies could be defeated by seeking a more wind exposed repose. Had the breeze died a few knots, the temperature risen a few degrees or any rain fallen that might have been a different story. I wouldn’t paddle in to an Assateague bayside site in mid-October, but Hammocks Beach seems to lack the voracious shoulder-season mosquito species that Chincoteague Bay harbors into mid-November. Another less wildernessy oddity about Hammocks Beach – Camp Lejune is the next chunk of land to the south. You will see and hear lots of militaria, including 50 cals booming in the distance and fly overs by tilt-rotor Osprey and all manner of Marine helicopters. Despite the omnipresent wind and the occasional visit by Marine aircraft Hammocks Beach is well worth a visit. And a revisit; I’ll be back. Sparkleberry Swamp: Not much has been written about this cypress swamp end of Lake Marion that loses paddlers regularly. More tips from the same member, these for Florida. 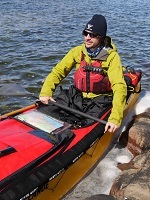 Midwinter paddling in the Southern US is not always a thing of comfort. Freezes extend regularly down to about Tampa/Orlando in Florida. Paddlers Guide to The Sunshine State by Sandy Huff. Many of them provide only a map, moderately useful information since it identifies a paddling opportunity. Amazon lists several books just on paddling the Everglades. More to come when I finish another job.